T3M is the 2.4GHZ RF wireless synchronization RGB controller which adopts MaxBrite multiple global initiate technology. The control system consists of two parts, the RF remote control and receiver; realize the signal synchronization on unlimited receivers within effective distance, a very good solution for the LED project needs sync control wirelessly. 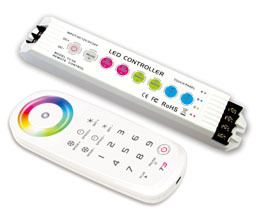 User-friendly full-color touch wheel for color selection, unique LED state light for sync change indicated, user can simply know the LED working state from distance by checking the remote control. RF remote control can realize long-range control switch, pause, changing modes, changing speed and the brightness, etc. Built-in more than 32 changing modes, you can store the changing modes in the short cut key what you like, which not only can call at any time, but also can combine into a program to loop playback.